Don't you just love having a crush on a book and its author? I'm not talking about creepy stalker sort of stuff. I mean, when a sentence stops you cold and you keep rereading it 'cause its beautiful, lyrical and new. 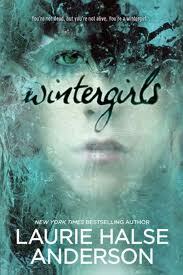 I felt this way about Michelle Huneven's BLAME a few months back, and I sort of fall in and out of crush with Franzen's FREEDOM (the density of his sentences alternately engages and annoys me), but my crush of the month is Laurie Halse Anderson's WINTERGIRLS. Anderson is the writer whose selectively banned debut book SPEAK heralded the Speak Loudly campaign earlier this month. I'm reading SPEAK, like it pretty well, but WINTERGIRLS is so asskickingly good, it's a hard follow up. I was loath to get to the last page of it I liked it so much, but now, a week after finishing it, it lingers like a supremely satisfying meal at a five-star restaurant. Perfectly paced, ingeniously conceived and written with startling authority in the first person voice of a seriously troubled 18-yr-old girl, the book takes wonderful risks, and seems to follow a vision that defies YA convention on all fronts: syntax, grammar, love interest (or lack thereof, for the only potential heartthrob turns out to be...*SPOILER* a jerk). The thing I love most about WINTERGIRLS, however, is Anderson's lyricism. 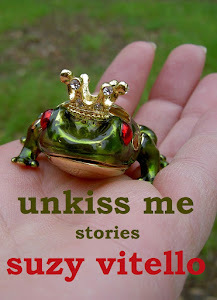 A quality I find lacking in many popular YA books. Often, language takes a back seat to plot and concept, and shortcuts abound on the sentence level. The musicality of WINTERGIRLS is phenomenal. Anderson channels the voice of her character, Lia, and never lets down. Not for a minute. The book soars with energy, from the opening line to the end. It's dangerous, delicious and dark, in a way that I find many YA books skirt in favor of the blockbuster moments: the dystopian constructs, the shape-shifting monsters, the big, bloody battles. In WINTERGIRLS, I found a powerful, true, gorgeous arc, relateable and contemporary, yet uniquely voiced and constructed. A hard act to follow. Now, back to the long-and-winding Franzen tome. Hi - I'm glad to see this, I will have to look for Wintergirls based on your recommendation. I discovered Speak by accident (I'm way too old for YA novels) and was very impressed. I found your blog by accident, too (some great things happen that way) looking for comments on "The Valetudinarian", a New Yorker short story you reviewed last year. It's in the 2010 BASS and I'm reading through the volume. I like to see what other people think. I wasn't very impressed by this story, though it certainly had good elements - but I loved what you said about him breaking rules and the shift of POV in the middle. Some people can get away with that. Here's to the day when you and I are among them.